Google Groups makes communicating with a group of people easy through online and email-based communities. Some groups are in high demand and have many active members or receive a lot of messages from external senders. Google Apps customers have told us that it’s time-consuming for group leaders to respond to every message individually. So based on your feedback, we’re launching a new auto-reply feature for Google Groups for Business to help streamline communications. Imagine your company has a Google Group set up for customer support, and the address is published on your website. 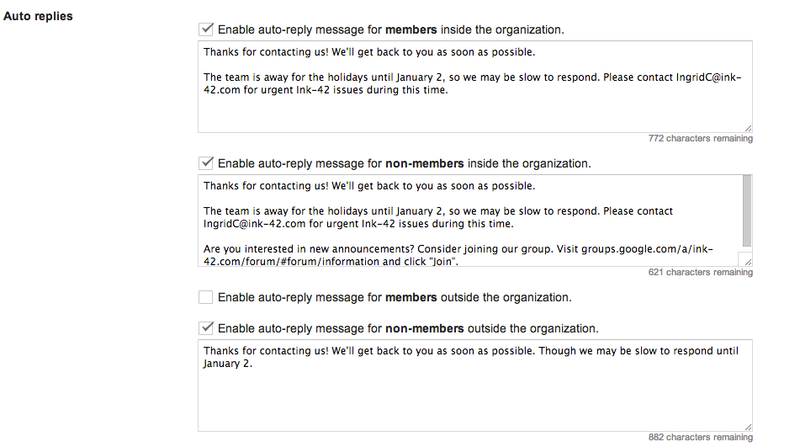 If the office will be closed during the holidays, setting up automatic replies could be helpful. For company employees who email the group, you can provide the CEO’s cell phone number in case of emergencies. 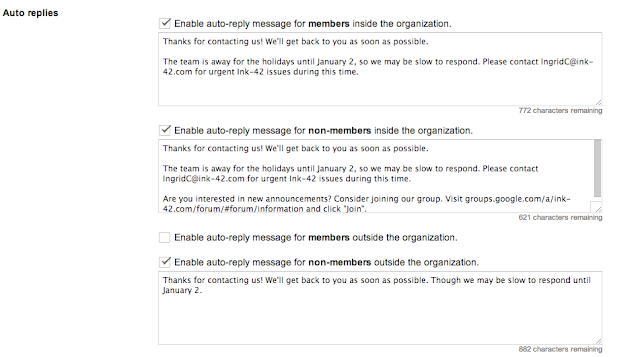 For non-members, you can add a note instructing them to join the group for updates. And for external customers, your automatic reply can say the company is closed for the holidays but will respond to inquiries after January 2. To get started using auto replies in Google Groups for Business, go to Email Options under your group Settings.